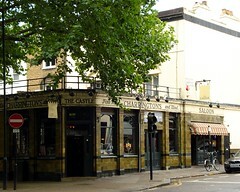 This popular pub is just 100m west of Holland Park Station, on Holland Park Avenue. It's part of the Mitchells & Butlers Castle sub-chain. Ornately decorated in red and gold, with dark wood and chandeliers, the pub was very busy on the Friday evening in January 2008 that elvum visited. Extremely noisy too, due to lots of people shouting over loud music. The food looked quite good. A pint of Greene King IPA was perfectly acceptable. Toilets were lavishly appointed. Last visited by elvum, 25 January 2008. Last edited 2013-07-24 21:24:29 (version 11; diff). List all versions. Page last edited 2013-07-24 21:24:29 (version 11).